Aloha! E komo mai... welcome to Hawaiian Wedding Shop, where you can find tons of wedding dresses... beach wedding dresses, Hawaiian wedding dresses, matching Hawaiian wedding shirts, and more. We are your one-stop shop for planning the perfect Hawaiian or beach themed wedding. We are proud to be not only the first, but premier company to offer everything you need for a beautiful Hawaiian wedding. We have a large selection of elegant Hawaiian wedding dresses and holokus, beach wedding dresses, and matching Hawaiian wedding shirts for your very unique and special wedding day. We manufacture the vast majority of our wedding dresses ourselves, right here in Hawaii, so our designs are always fresh, innovative and contemporary while incorporating that romantic Hawaiiana. Make sure you bookmark our site so you can come back and visit us often! Grab a cup of hot chocolate or glass of iced tea and get comfortable as our site offers comprehensive Hawaiian and beach wedding items. We know every bride wants to plan the perfect wedding, and we'd like to help you do just that. We also have Hawaiian wedding favors and centerpieces to tie your theme together. Whether you're planning a Hawaii theme wedding or attending one, we've got wonderful Hawaiian gifts appropriate for bridal party attendants or as wedding gifts for the happy couple. Are you planning a beach wedding and are you frustrated to find that "informal wedding dresses" advertised by other online shops are not really that informal; they're too "poufy" and much too hot for the beach? Relax... you found us and we really do have informal wedding dresses, whether you're looking for Hawaiian wedding dresses or elegant but simple "beach wedding dresses". 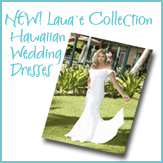 All of our Hawaiian wedding dresses are made in Hawaii, with aloha! Be sure to keep checking back as we are constantly adding only the best products from Hawaii to our product offering... some of our items are from talented artisans and crafters here in Hawaii, and are not available anywhere else on the web. We are very excited about the newest addition to our ever-growing family of Hawaiian wedding attire, our Laua`e Wedding Collection. Absolutely gorgeous new Hawaiian wedding dresses and holokus are now available along with matching Hawaiian wedding shirts (long sleeve beach wedding shirts, too!) for the groom, as well as matching flower girl dresses and ring bearer shirts, all made here in Hawaii. NEW BEACH WEDDING DRESSES! 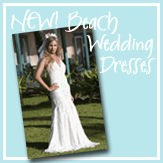 We're also always adding beautiful new beach wedding dresses to our beach wedding dress section! © Hawaiian Wedding Shop. Since 2002. All rights reserved. Photos and text may NOT be used without written consent from us or at the very least, credit and a link back to our product and/or site. Trying to pass off our wedding dresses and models as your own work/photography... it's just not cool. We have so many great shots from our photoshoots, we thought it would be a shame if we didn't share more pictures of our beach wedding dresses and wedding shirts. This way you can see more of our beach wedding dresses and Hawaiian wedding dresses and can get an idea of what getting married on the beach will really be like! And, of course a beach wedding website wouldn't be complete without a gratuitous beach photo. Whether you're looking for an elegant yet casual Hawaiian wedding dress or affordable Hawaiian bridesmaids dresses, we've got it all. Our high-quality, extensive selection of cool poly/cotton, 100% rayon, and 100% cotton Hawaiian wedding dresses are not only unique, but you can wear them again, too! We also have matching Hawaiian wedding shirts for a casual, yet stylish, beach wedding. Find the perfect wedding dress in our many collections. We are always developing our line of informal wedding dresses; keep checking back as we are constantly updating this section with beatiful new wedding dresses for the beach. Look no further for both English and Hawaiian lyrics. Share your Hawaiian style wedding with the world! Email us your pictures and we will include it in our Hawaiian customer wedding album.